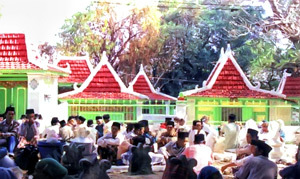 Asta Yusuf is a Grave of a Moslem regarded as the man who spread up Islamic religion especially in Madura and Sumenep regency. Therefore, his grave has been often visited by Moslems to honour his merit. Asta Yusuf is located in Talango district, Poteran Island, one of island in Sumenep regency. It takes five minutes to cross by machine boat from Kalianget Port. Crossing the sea from port Kalianget to Poteran Island is enjoyable since one can see some fishermen and their boats are waiting for the passengers and the boats with passengers in are crossing the sea. Visit Asta Yusuf Grave that believed as sacred grave. Have a pilgrimage tour here and enjoy its interesting journey in Poteran Island.